Congenital hypothyroid may present with reduction in the level of total T4 and free T4. There will be elevation of the serum TSH. The symptoms and signs of congenital hypothyroid are large fontanelles, jaundice, poor tone, thick tongue, umbilical hernia, hoarse cry and growth retardation. There will be circulating antibodies to thyroid peroxidase or thyroglobulin. 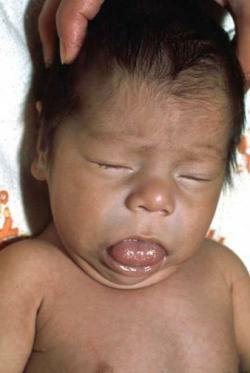 The treatment of congenital hypothyroid include levothyroxine. The differential diagnosis of congenital hypothyroid are sick eurothyroids in ill infants, hypothyroidism, hyperthyroidism, transient hypothyroidism in prematurity or lead poisoning.